So I'm finally back from Los Angeles, recovering from E3, and working my way through American McGee's Alice Madness Returns. It's out today, and while I figured I'd be done with it by now, this is a game that features some of the longest stretches of single chapters that I've ever played. That's not entirely a bad thing, as I'll get into when my review goes live. While you wait for my verdict, I figured I'd share something I came across today while exploring Wonderland. 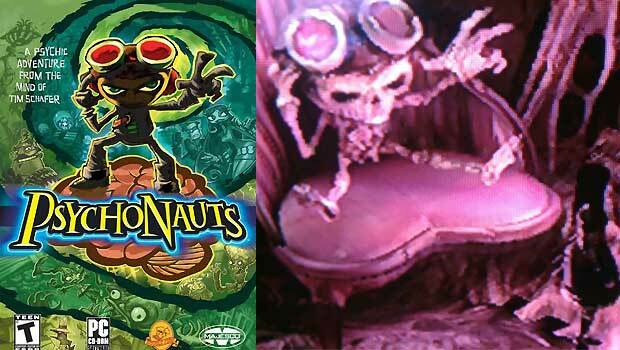 Buried in a hidden hole (along with one of Alice's collectible in-game memories) was a skeleton that looked awfully familiar... is that Razputin "Raz" Aquato from Double Fine's Psychonauts? It's hard to tell with his skin off and all, but the likeness is hard to deny. So about that Psychonauts sequel... I sure would like to see Raz with some meat on his bones, Double Fine.